Two letterpress studios are located in North Hall. Letterpress print classes meet in the Type Kitchen, which has a Vandercook Universal 1 and two Vandercook SP-15 presses. Advanced students and faculty have access to the Graduate Studio where there are three Vandercook SP-20s. Between the two studios there are over 600 cases of type available, including Joanna, Bembo, Gill Sans, Spectrum, and a number of cases of wooden type. In 2012, the Type Lab—supervised successively by Carroll Coleman, Harry Duncan, and Kay Amert—moved to the UICB, expanding the range of options for typesetting in newly designed North Hall workspaces. Other equipment includes a NuArc platemaker, a Polimero A3 photopolymer exposure/washout unit, five iMacs with current design software, a tabloid size HP laser printer and a large format Epson 4800. We offer courses in traditional and innovative letterpress printing, hand-set type, digital book design, and typeset and digital artist book work. 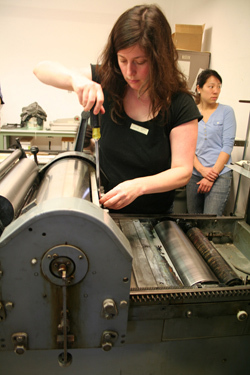 The Center offers courses in letterpress printing, hand-printing, and digital typesetting. Check listings at MYUI for course availabilities and offerings; enter "UICB" in the course subject field, then click on "Search." Printing courses offered through the Center are listed below. Introduction to letterpress printing for non book art majors; metal type, relief printing, page layout, and basic typography; basic use of Vandercook Proof Press; experimentation with diverse letterpress techniques. Mechanics of letterpress printing, typography, and design as applied to hand set metal type and edition printing; printing on a Vandercook proof press; introduction to photopolymer plates and methods of illustration related to edition printing, historical aspects of printing technology, typecasting, type classification; role of letterpress in modern private press and contemporary artist books. Builds on skills acquired in Letterpress I; students produce an editioned letterpress printed chapbook or artist book, a poster for a public event, and an image built from metal type; exploration of hand‐set metal, digital typesetting, printing from photopolymer plates, and pressure printing; press mechanics and operation; publication philosophies, manuscript acquisition, and topics specific to literary fine press and artist books; historical and contemporary context for literary fine press publications and artist book work. Advanced work in fine press book design. Exploration of problems in hand-printing books--choice of manuscript, editing, design, typesetting, proofreading, printing and binding; histories of printing and of the book, emphasis on 20th- and 21st-century book design and literature. Issues of book design and production related to letterpress printing. Advanced work in alternative and innovative letterpress technologies as they apply to imagemaking processes for fine press printing. Topics include pressure printing, photopolymer from non-digital negatives, explorations of type-high surfaces, monoprints on the Vandercook, applying hand work to editioned prints. Students complete a series of print exercises for each process, a small printed book sketch, and a longer format editioned artist book. Development and/or production of one substantial project; focus on acquiring or creating a text and/or other content; project development; range of print techniques available in letterpress printing; issues involved in producing editioned artist books or fine press work; opportunity to expand existing printing; classroom setting augments work sessions with in-progress critiques, readings, and visits to special collections. Special topics and advanced projects in printing.